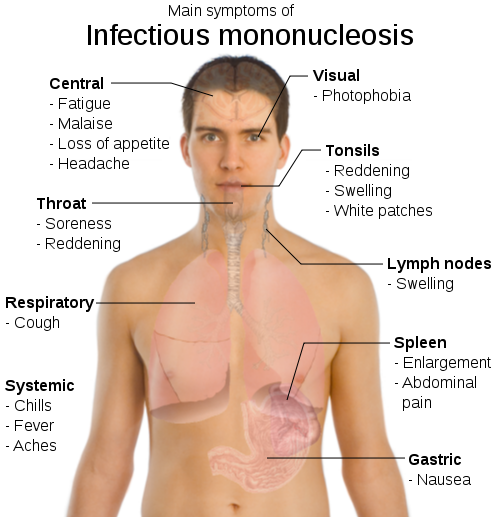 Mononucleosis is a viral disease that makes patient feeling more tired and exhausted. This infectious disease is also called “kissing disease” caused by Epstein-Barr virus (EBV).This article will give a deep insight into its signs, symptoms, and causes and for how long does mononucleosis lasts. People who become infected with this virus carry it for their whole lives. Cytomegalovirus is another virus causing the same symptoms like EBV.A person suffering from mono neither should nor transfer it to healthy people by kissing, sharing utensils or toothbrushes. If, however, mono is cured yet the virus causing it will remain in the body throughout the life and can be active at any time without any evident symptoms. Specific symptoms of mono showing signs of mononucleosis includes sore throat, high fever,weakness,swollen glands,tonsils and fatigue.After exposing the virus,symptoms generally start 4 to 6 weeks. There can be severe pain in the upper left abdomen indicating a spleen burst out and an emergency treatment. It is most probable that mono can be caused with just a quick peck on lips because its virus is carried in saliva and can more readily be transferred by sharing spoons, forks, lipsticks, lip balm etc., which shows how prevalent is mononucleosis. In case if someone has symptoms of mono, doctors recommend a blood test called “Monospot”.It usually takes a couple of weeks for Monospot to detect if the person’s blood is positive for mono but if blood tests show negative results and according to doctor, there is mono than many other blood tests are recommended. How mono can be treated? There are few steps for mononucleosis treatment and self care therapy is generally needed for mono. Person should have a plenty of bed rest. Repeated to gargle with salt water as salt is anti septic. To relieve headaches, fever and sore throat simple pain reliever can be taken. Patient should avoid heavy sports and weight lifting. It is avoided because the spleen may be enlarged and any additional strain will cause it to burst. In another case, a ruptured spleen would need an immediate surgery to repair. That’s way to avoid spleen rupturing sports are not allowed for at least 4 weeks.